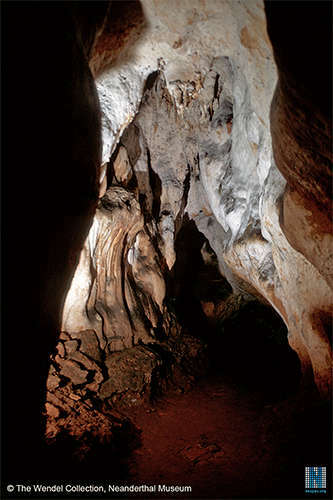 Grotte de la Mouthe was discovered in 1894, and was excavated by Emile Rivière. 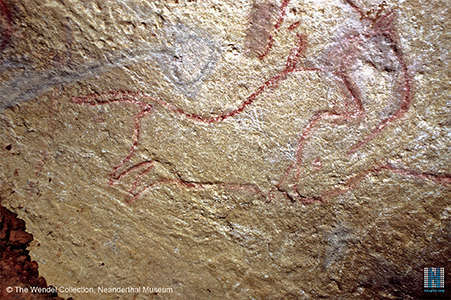 It contains more than 200 engravings and paintings of bison, horses, deer, cats, wolves, as well as two hands and a tectiform. 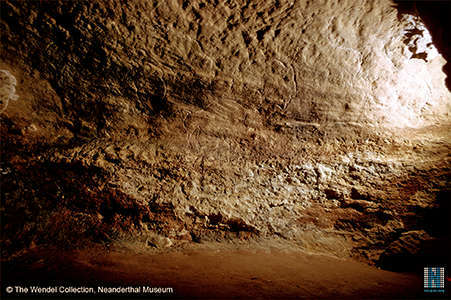 The deposits in the cave record its use by Neanderthals and modern humans, based on the tools which were found there. The site is not open to the public. Map of sites in the Vézère Valley of France, including grotte de la Mouthe. 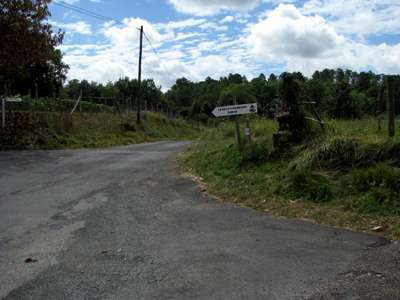 This series of photographs shows the approach to La Mouthe, which is not easy to find, nor to see from the road. 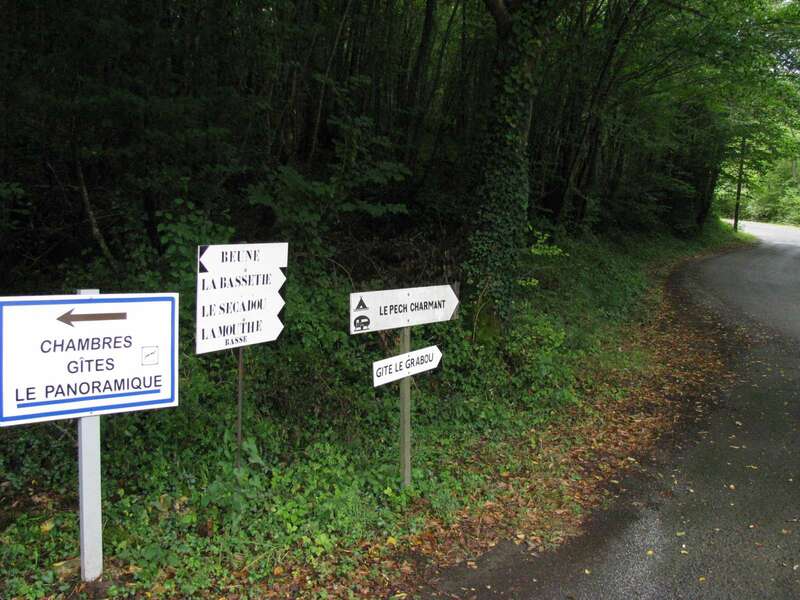 The photographs are in order as you approach la Mouthe, which is across a cow pasture (containing cows!) and a couple of fences. The walled entry is only barely visible from the road, as in the photo at left. When I was there, I was told that the gentleman who owned the land had died, and the cave was not open. I have been very interested to read your page about this Grotte, in the Dordogne, since I was lucky enough to go into it! It was in 1977 or 8 and I was using an old Green Guide which showed it as open, hence persisting up the farm track despite doubt from my husband. We arrived to find the farmer at lunch. He gestured to us to wait in the car and when he had finished came out of the house bearing three oil lamps, one for each of us. We followed him to the door in the walled entrance which he unlocked and in we went. Words cannot do justice to the paintings and carvings and viewing them as we were, with the oil light, it was as if we were the first to view them since the cave had been abandoned. I could have stayed for hours but we were allowed only about ¾ hour to gaze in marvel at this wonder before exiting. There was no charge for the 'tour' – one simply tipped the farmer. I returned in the 90s, hoping to show it to my daughter, but the farm was deserted and the vegetation had grown over the cave entrance – perhaps encouraged deliberately? I do think it is sad that no better records exist as in its way it is as astonishing and marvellous as Lascaux. (left) Plan of La Mouthe. 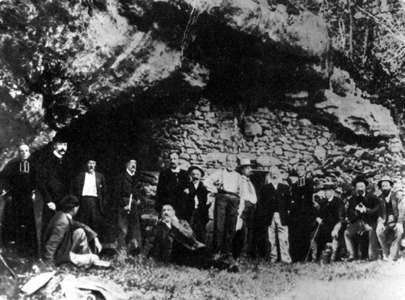 Meeting of the Association francaise pour l'avancement des sciences in front of the Grotte de la Mouthe (Dordogne) on 14 August 1902. The rock wall has been rebuilt since this photograph was taken. Photo: Display, Grotte de Niaux. 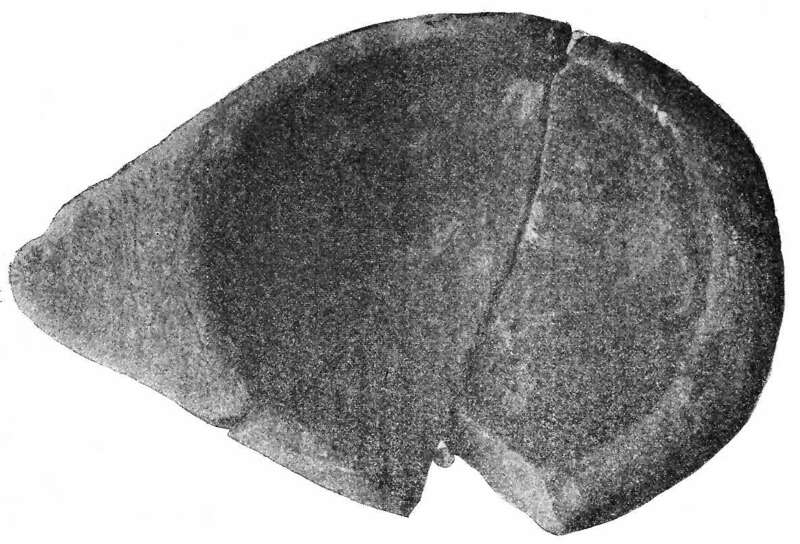 Truncated blades and burins from La Mouthe, upper Palaeolithic. 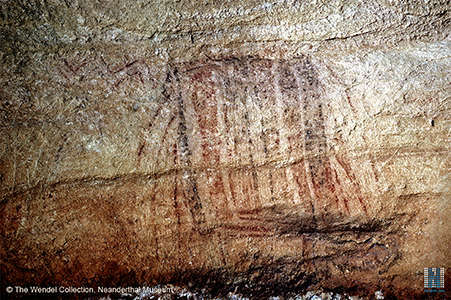 Painting of a hut in Grotte de la Mouthe. 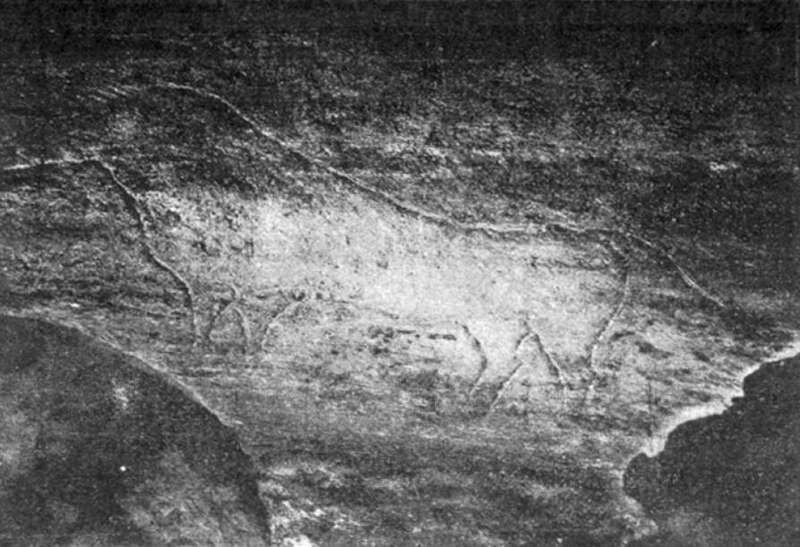 Engravings of Aurochs and Bison. It should be noted that all of these engravings have apparently been delineated with colour in modern times, perhaps with chalk. This image shows what are apparently an aurochs right way up (Iower centre in red), an animal (upper centre right, with a long strong tail) shown rotated 90° anti-clockwise in this view, the tail of which morphs into the back of the aurochs, an animal in blue/grey and red which has apparently been defaced (left) and what may be the head of another animal, formed by the right horn of the aurochs and two ears which are otherwise detached. There are other red lines in the right lower corner of the image. 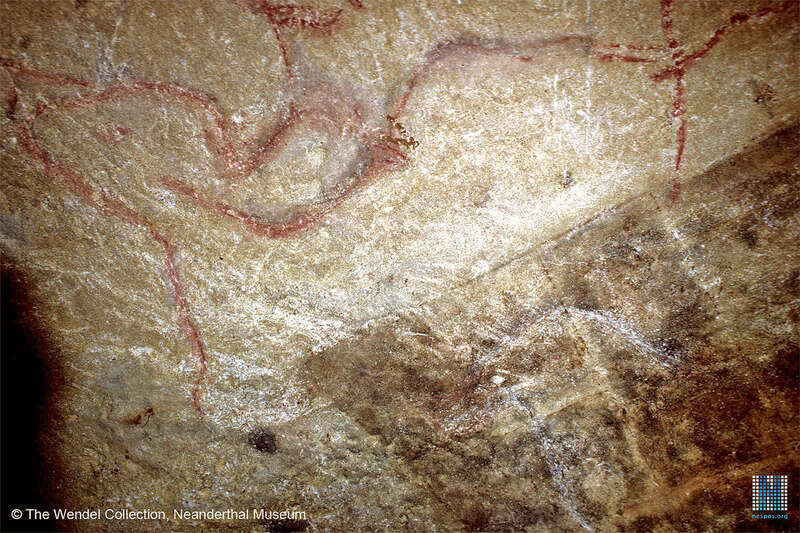 This shows the head of the aurochs rotated clockwise by 90° at the top of the image. 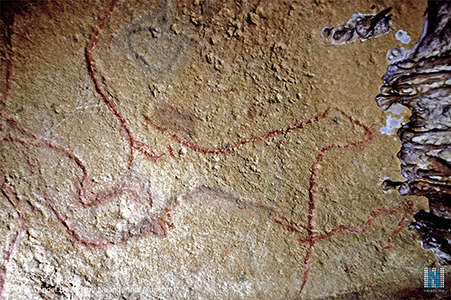 Below and to the right of the aurochs are the front legs, shown as two (or four) crossing lines, and the ventral line of the animal with a strong tail, with an extra line on the left. 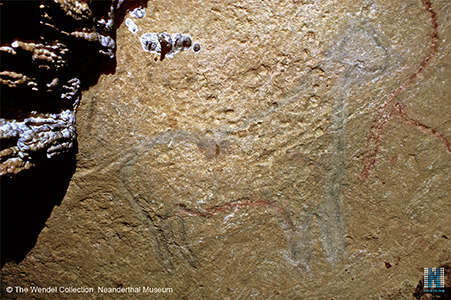 At the bottom of the image is what appears to be an erased outline in grey of what might be the head of a horse. 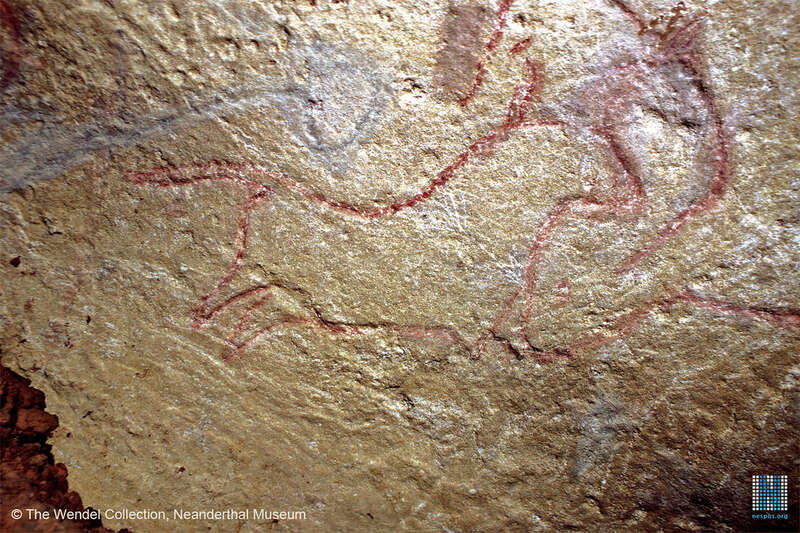 Close up of the unidentified animal with a strong tail, possibly a feline, and the aurochs head rotated 90° clockwise at the upper left. 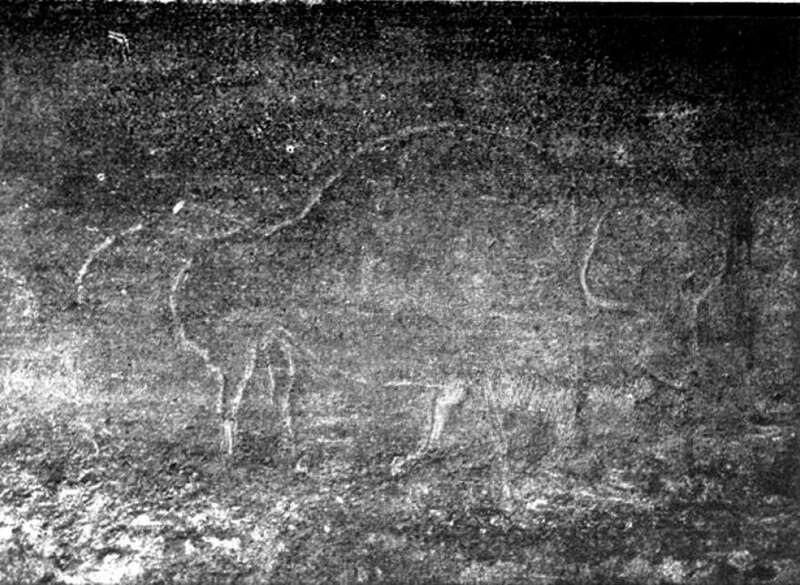 (left) Blue/grey erased image of an animal on the left, aurochs with a long flowing tail at the centre right, and the unknown animal (feline?) in the centre top. (right) Close up of the aurochs. Close up of the blue/grey erased image of an animal. It appears to have been engraved, painted in the engraved outline, then the ochre has been rubbed away. Salle de la Hutte - close up. 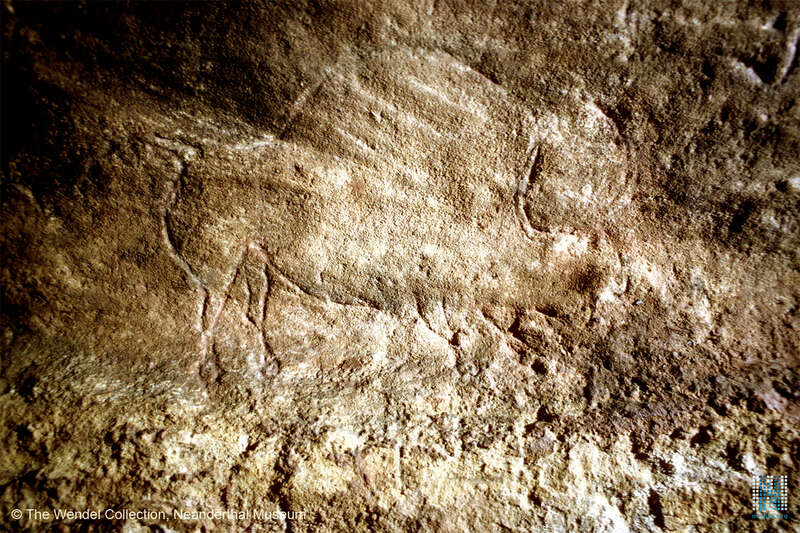 Beautifully drawn Aurochs in la Salle des Bisons. General view of la Salle des Bisons, with the Grotesque Bison in the centre of the image. 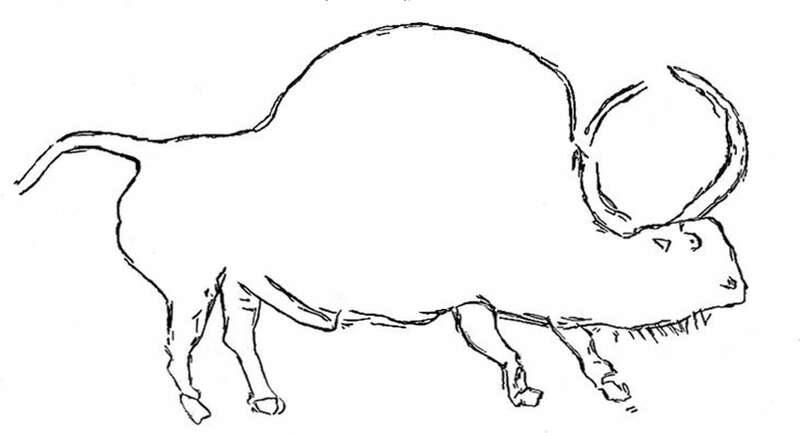 Grotesque Bison, with a very large dorsal hump and a head far too low on the body, in la Salle des Bisons. 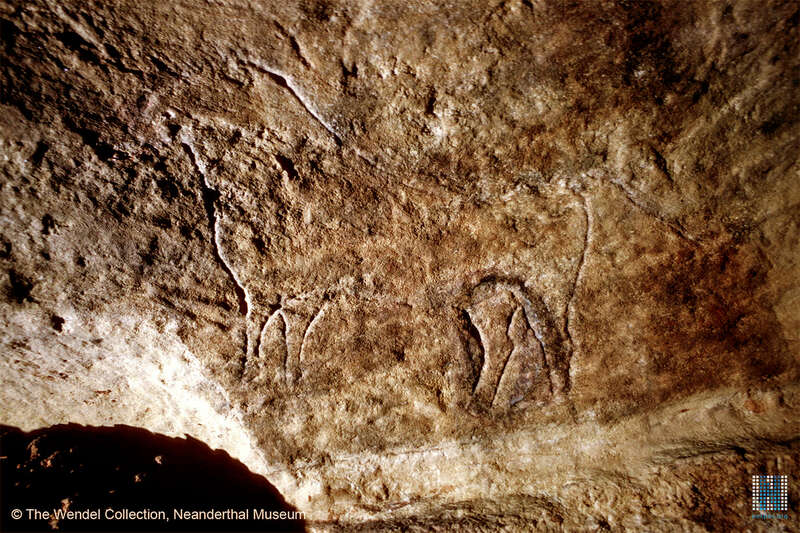 The animal is engraved in profile at about 97-98 meters from the entrance and on the left wall. The dimensions of the drawing are far from being those of the original animal, being 91cm in length from the nose to the end of the tail, and about 52 cm high. A modern photo of the base of the lamp from Grotte de la Mouthe. Photograph from Rivière (1899) showing the ibex engraved on the underside of the lamp. This lamp appears to have been carved from a pebble of Permian sandstone which is abundant in the basin near Brive, about 40 km as the crow flies from Les Eyzies. 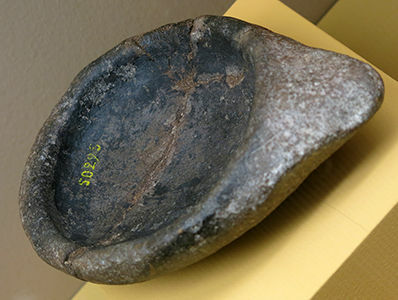 It may well be that the Vézère or any of its tributaries have rolled a fragment of this rock, which may have been picked up in the river near Les Eyzies, or in its vicinity and carved for use as lamp cup, while one of its ends was ground down and rounded to serve as a short, thick, triangular handle (4 cm long). The total length of the lamp is 171 mm, handle included. The cup has been carved in a regular circular shape, and , measures 106 mm longitudinal diameter and 104 mm transverse diameter, with 34 mm as its greatest depth, in the centre. Finally, its thickness is 45 mm. The edge is also thicker at the opposite end to the handle and has no grooves. Its general color is dark gray, except in the interior of the cup there is a sooty black appearance of fat, or materials which have been burned for lighting the cave. The outside of the lamp face on which it rests is convex, except in its central part, which is almost flat. It presents an engraving reminiscent in an astonishing way, but in much smaller than those which adorn the walls of the Grotte de la Mouthe. Indeed, this drawing represents the head seen in profile, of an ibex, a remarkable detailed head: nose, mouth, eyes, ears, horns of a considerable length (they measure up to 12 cm for one and the other 13 cm) and strongly curved in a semicircle. 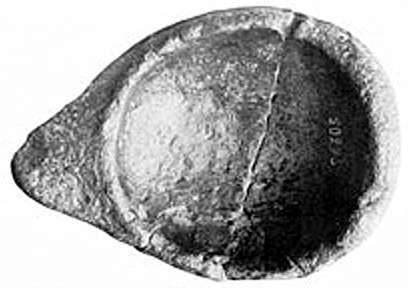 The oval head measures 35mm in length and its greatest width is 23 mm. Two lines are drawn to indicate a fairly long neck. 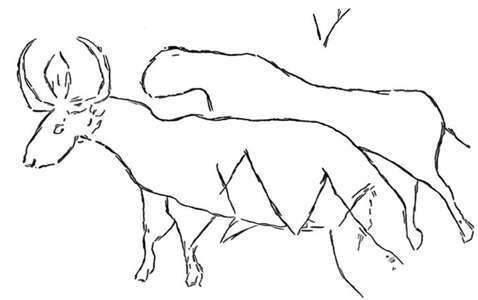 The body and legs of the animal are not drawn. The lamp from La Mouthe. This photo shows the lamp restored with the missing piece either found or skilfully restored. We can see the four parts into which the lamp was originally broken. Lamp from La Mouthe, Dordogne. The mouth of the ibex can be seen on the base of the lamp. Piece with retouched back, la Mouthe. Location: The cave is in upper Cretaceous limestone, and is located about 300 m from the hamlet of that name, with an altitude of 193m in the commune of Tayac. The entrance is a semicircular bay oriented south-east, 10.95m wide and 3 meters high. 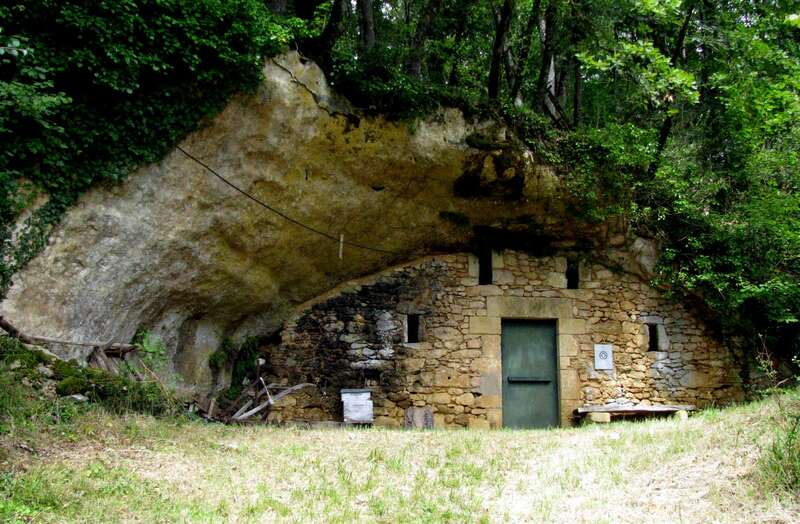 History: In 1895 E. Rivière found that the cave was closed by a dry stone wall, it had been used as a barn by the owner and some of the archaeological deposits had been dug out and spread in the fields, but except at the entrance, the filling was intact and was almost to the ceiling. 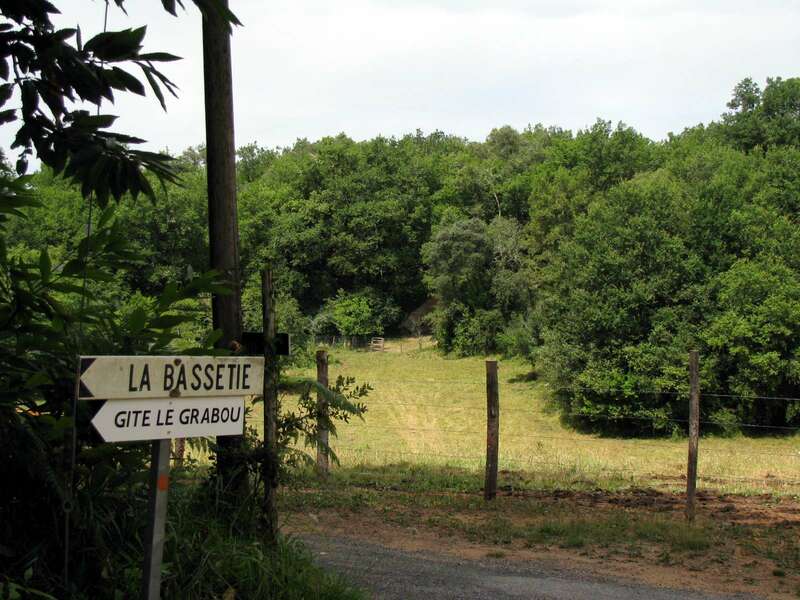 Rivière opened a trench 140 m long, with a width of 6 m to 1 m, and a depth of 2 m. The search was executed according to the methods of the time, so it did not involve any question of fine stratigraphy, that is to say, it was done "with pick and shovel", in the words of Rivière. 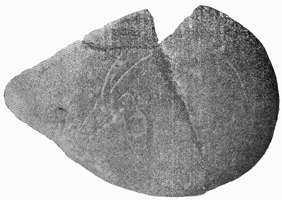 Thus a beautiful sandstone lamp was broken in four pieces, including one which was never found, with an ibex engraved on it. From his excavations (1895 to 1903) Rivière could distinguish 'three distinct superimposed epochs '. 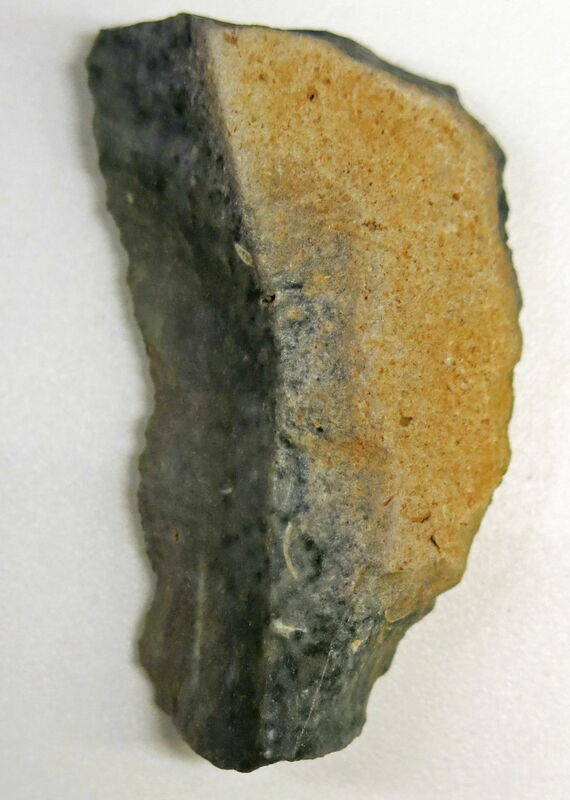 Above, a limestone/calcite layer, with blackish-gray 'Neolithic' fireplaces with modern fauna, pieces of coarse blackish pieces of pottery, flint very rare, two fragments of polished axes, human bones. 2 Limestone/calcite of variable thickness. 3. Magdalenian level with fireplaces, thickness 40 cm to 55 cm, blackish sandy soil, ash and carbonaceous material. Flint. Bone industry includes points, bone tools, fragments of needles, a short spear with a double bevel, a pin 18 cm long, etc. There was not a single harpoon, tooth, or pierced shell. Some Solutrean pieces in the mixture. 4. 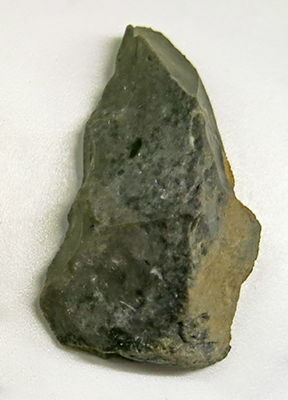 Mousterian clay layer, scattered or disorganised, in which the flints have sometimes worn edges, nine Mousterian bifaces found. Wildlife includes reindeer, rhinoceros, etc., but especially the bear and hyena. A wildlife haven, one tooth is attributed to a hippopotamus. 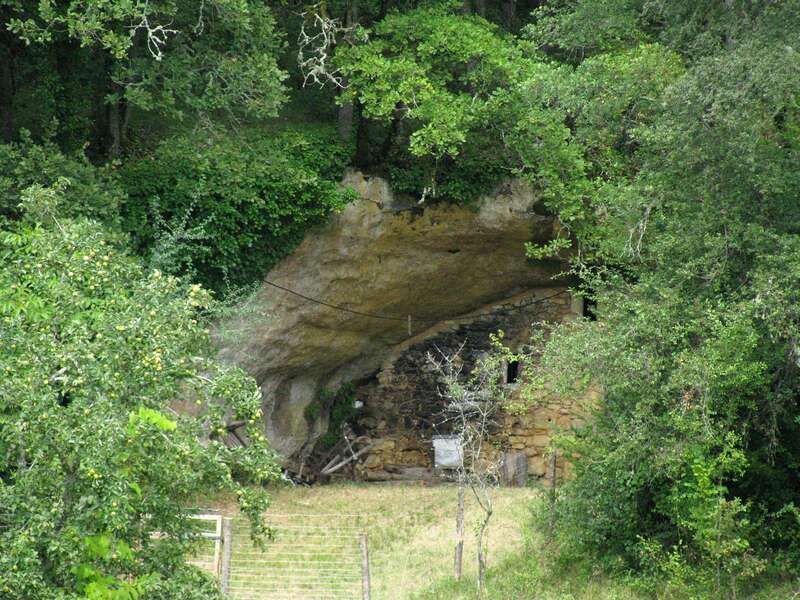 These sporadic finds would approximate those of the great cave of Arcy and Roche-au-Loup Merry (Yonne). 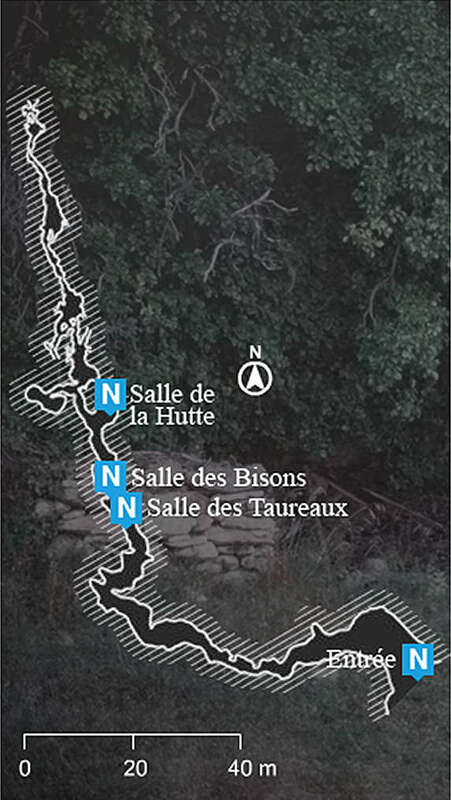 The researches of Rivière were subject to the remonstrations of Dr. Salmon of la Societé d'Anthropologie (1897) who clearly indicated the stratigraphic gaps. 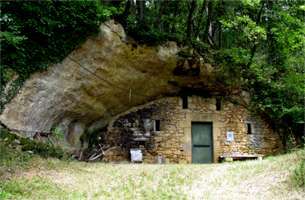 He stated 'I asked E Rivière to kindly give the notes layer by layer and in order of deposition, the zoological debris and other objects of industry in contact with them in la grotte de la Mouthe, to kindly submit the bone and flint tools collected by him, but in the successive order in which they were in the soil of the cave. This methodical process has the ability to take away uncertainty and provide clarity. Some material hardship seems not to have allowed our colleague to classify observations in stratigraphic order, he has merely a general list of cave animals irrespective of the level and types of instruments based on their morphology'. At the public sale made at the hotel Drouot in 1922 of part of the Rivière collections, I was able to acquire for a small fee, a locked box of which I did not know the contents. It was one of many unlabelled boxes some of which, I think, for lack of purchasers, went to the garbage! This box contained no indications of levels, whether Mousterian, Upper Palaeolithic or very rare Neolithic remains, or more recent artefacts. None of these pieces had been washed. In the absence of stratigraphic data, my classification is merely indicative, but given the presence of sufficient characteristics it can be said that the artefacts classed as Magdalenian by Rivière, came from several horizons, and which were probably mixed up by the excavators. Nos. 1 to 7, Perigordian. 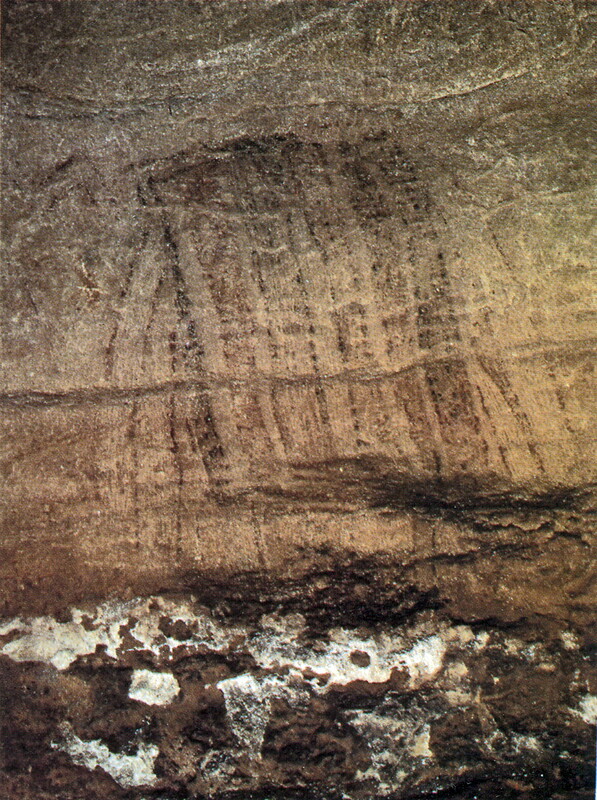 8 to 14, typical Aurignacian. The presence of the Perigordian I is attested by the presence of some knives with backs more or less arcuate of the Chatelperronian type, perhaps the evolved form. These knives still bore the traces of their burial, with a somewhat glossy, black and gray patina. Two of these knives were worn and the edges show traces of clay, like the Mousterian flint from the lower level. Further, it is interesting to note the presence of a few Chatelperronian knives/points as at the small grotte de Combe, located in the immediate vicinity of La Mouthe. "The absence at "la Combe" of distinct alternating sterile layers increased the difficulties in the way of a clear-cut demonstration". The Solutrean is very poor, as has been reported by Rivière, mixed with the Magdalenian. It consisted of (IV, Fig 37, Nos. 2 to 4) of laurel leafed blades and a shouldered point. Personally I have only the tip of a flat face point (Fig. 1, No. 15). 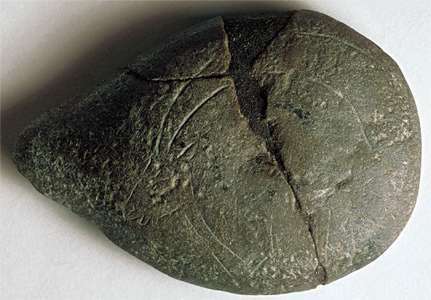 A small pebble, like those collected in the middle Solutrean may in fact may be part of this sequence. 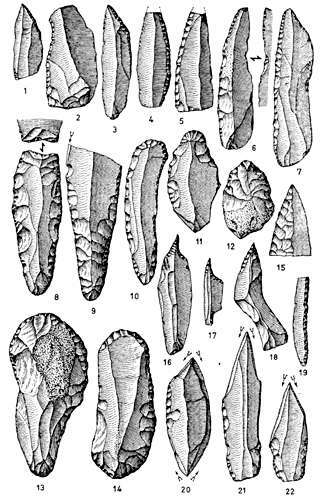 The Magdalenian is well represented at la Mouthe, it includes beautiful blades, numerous single and double burins chisels, with a predominance of straight dihedrals (Fig 1, our 20 to 22) rarely warped or truncated. Scrapers according Rivière were few, they are sometimes associated with a burin, or a fine awl (Fig 1, our 16-17), backed blades (Fig 1, No. 19) Upper Magdalenian without being able to more precisely define them, especially without sufficient remains and the lack of type tools such as beaked burins and harpoons. 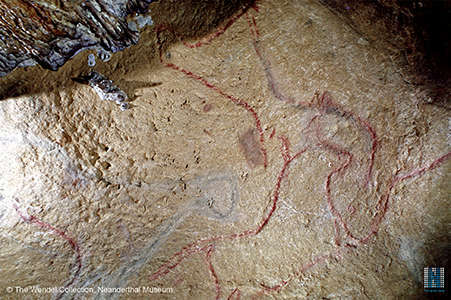 It is possible that as at la grotte Combe, stratigraphy has presented certain difficulties which the methods employed have failed to solve, any review of materials shows the complexity of archaeological deposits in a level from 40cm to 55 cm, attached to the whole Magdalenian. Archaeologically La Mouthe was a small deposit. I have the honour to present to the Anthropological Society reproduction of some new engravings I have ​​discovered in the cave of La Mouthe since my last communication here, except for some which I shall present later. I do not recall the exact circumstances surrounding the discovery of the cave when I entered it on June 11, 1895, for the first time, and I do not speak either of the considerable work that began at that time and since then I have continued, every year, for some years. I do not further describe the hearths from different eras, Palaeolithic and Neolithic, that I discovered and explored from the entry and for some distance into the cave, and finally I will not go into any detail on the wildlife and the contemporary industry of each that can be dated with certainty, it would be unnecessary to repeat what I have said and shown repeatedly both here at the Institute, the French Association, and so on. I confine myself to the presentation of drawing I brought to show you and to submit a brief description of engravings, which have been faithfully reproduced. There are only seven drawings which I show you today. I have discovered many others, but time did not permit me to draw, to trace, or to reproduce them by molding. 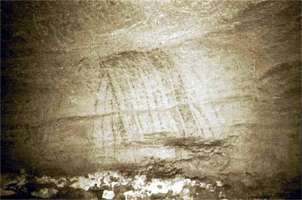 I have, in fact, in the study of La Mouthe, during the time occupied in exploring the hearths, uncovered engravings and extracted them, during the course of excavating the material which almost completely fills the cave to the roof, deposits of a thickness so great that there is still much to uncover. 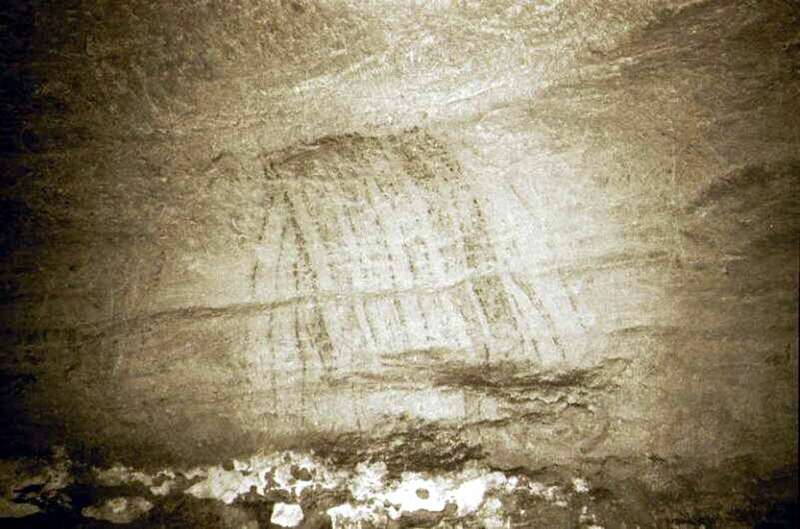 The engravings of La Mouthe form on the walls of the cave a number of panels so to speak. The seven drawings which I present here have been reproduced as accurately as possible, from three different panels: one about 97 metres from the entrance of the cave, the second at 113 metres and the third at 128 metres. 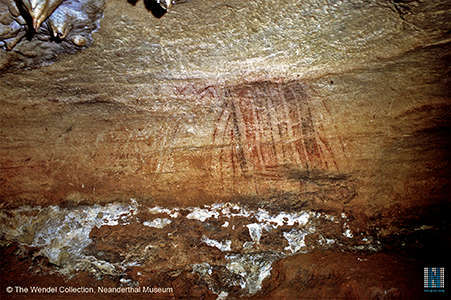 Two of these drawings belong to the first panel, they are firstly a Bison, the other a Bovidae as well as traces of another animal. Three designs have been recognised from the second panel. They depict a reindeer, an ibex, and a mammoth, and finally there are two horses. Wisent in the Wisentgehege Springe game park near Springe, Hanover, Germany. The European bison or wisent ( Bison bonasus) is the heaviest of the surviving land animals in Europe, with males growing to around 1 000 kg (2 200 lb). 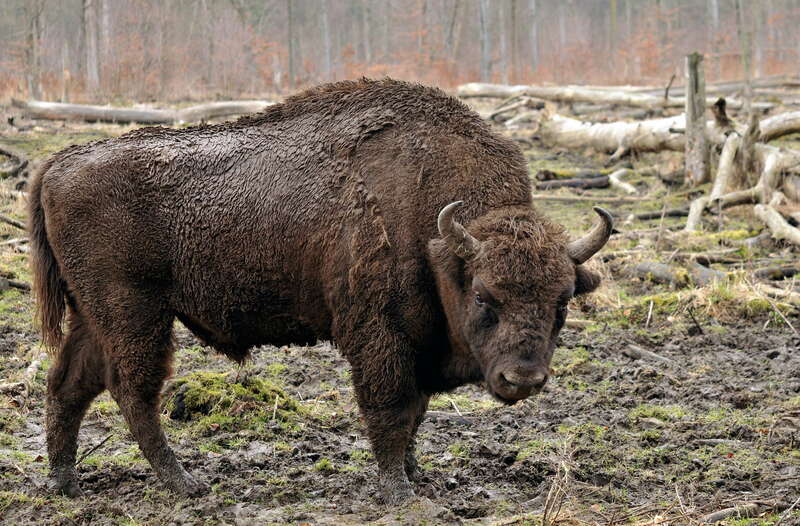 European bison were hunted to extinction in the wild, but have since been reintroduced from captivity into several countries. This male is moulting, his winter coat coming off in clumps. Permission: licensed under the Creative Commons Attribution 3.0 Unported license. The head is small and well formed. The horns are well drawn and almost meet at their ends, forming an almost complete circle, but they do not have the normal implantation in the head of the horns of the Bison. Under the lower jaw, one sees many hairs. As for the bump that characterised many of the Bovidae, it is huge and, as I said earlier, out of proportion to the size of the animal. It begins as it were, from the first cervical vertebrae and reaches behind the sacral vertebrae, that is to say, almost to the origin of the tail. The tail is relatively wide at its base, and bends in a fairly pronounced way towards the ground, and ends in a tapered tip. 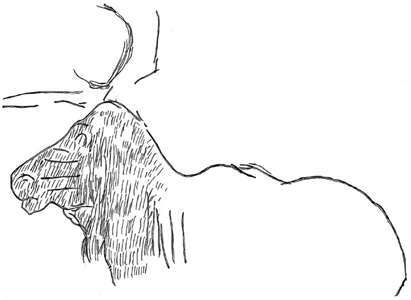 (The end of the tail has not been reproduced in the drawing as published - Don )The legs are well shaped, as is the line of the rump, however the rump is a little spindly and extended. The ventral line is slightly convex at the base. The next image is also that of a Bovidae, perhaps even two Bovidae, given the tangle of lines, but it is not a Bison. There is no trace of a dorsal prominence or hump, and there is no hair on the lower jaw. The length of the drawing is 88 cm, and height 55 cm. The two animals, that is if there are two animals, have only one head. This is thin and seems more that of a cervid rather than a bovid, but there are two horns above the head, curved to form almost a complete circle, there is only 35 mm between their ends. Between the two horns we see a kind of ear - a well formed ear - poorly located on the head. 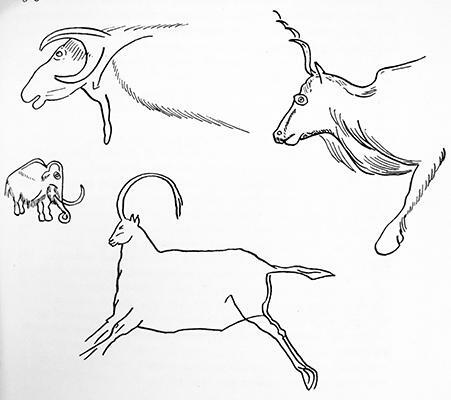 The two front legs are a bovid, but as to the hind limbs they seem to belong, with the rear end, to a second animal, rising above the first, and one sees, in addition, that the dorsocervical line bends forward to simulate a head, but it is too crudely drawn to draw any firm conclusions. The Bovidae itself is drawn in left profile, and on the side you can see a some lines, pairs of intersecting lines parallel to each other, which go down as far as the ventral line. 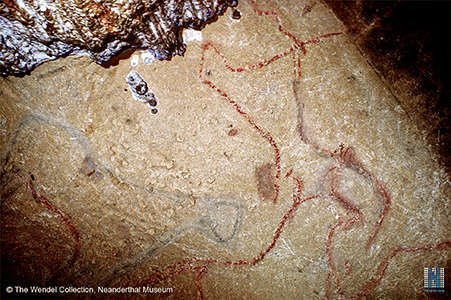 The entanglements of this representation have great similarities with the engraved bone and antler drawings found in Magdalenian sites. I should add that above this dual representation we can see two engraved lines meeting at the bottom to complete the leg of another animal whose design is engraved on the same panel, out of frame of this drawing. 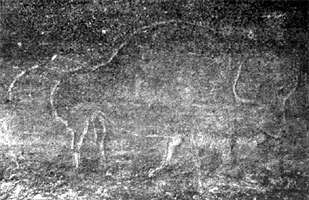 The engraving of the Reindeer is one of the best known images from La Mouthe. It measures 107 cm in length. The head of the animal is very well executed, I would even say remarkably so. It is also the most recognisable drawing in the cave, and is an outstanding piece of art, streaked with a host of vertical or slightly oblique lines running from right to left, some of which cross the line of the neck, representing hair. The profile of the head is surmounted by the base of an antler, directed horizontally from the back to the front. The muzzle, the mouth and nose, is also very well executed. By contrast, the body is proportionally too short (it measures 70 cm from the front part of the neck to the base of the tail). I would add that the animal is incomplete since, on the one hand, the withers barely exist, and on the other hand, just a single line indicates the back and the line of the derrière. Raoul, D., 1960: Grotte de la Mouthe (Dordogne). Contribution à l'étude de son outillage, Bulletin de la Société préhistorique française, 1960, tome 57, N. 9-10. pp. 627-631. Rivière E., 1899: La lampe en grès de la grotte de La Mouthe (Dordogne), Bulletins de la Société d'anthropologie de Paris, IV Série. Tome 10, 1899. pp. 554-563. Rivière E., 1901: Les dessins gravés de la grotte de La Mouthe (Dordogne), Bulletins de la Société d'anthropologie de Paris, V Série, tome 2, 1901. pp. 509-517.